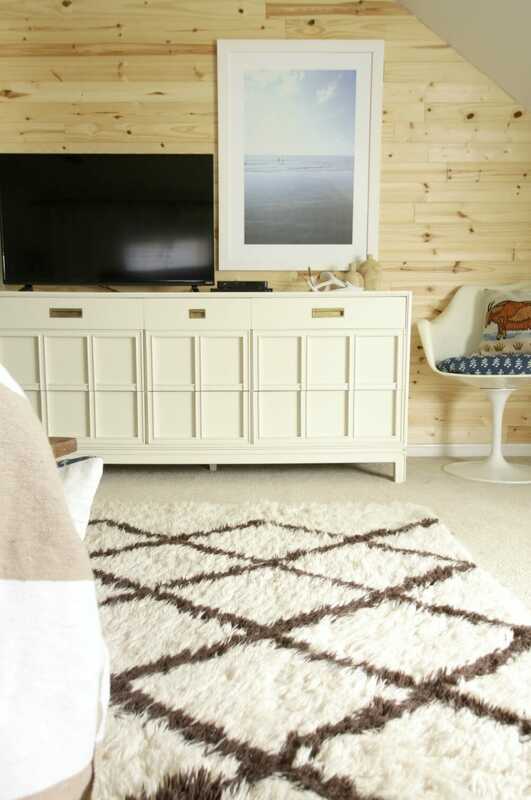 A few weeks ago I shared some plans for changing up my master bedroom a bit, including ditching the vintage-screen-as-headboard I’ve had for a couple of years. I also asked for your input as I felt like the creamy dresser I had wasn’t quite working with my walls and I planned to paint them. 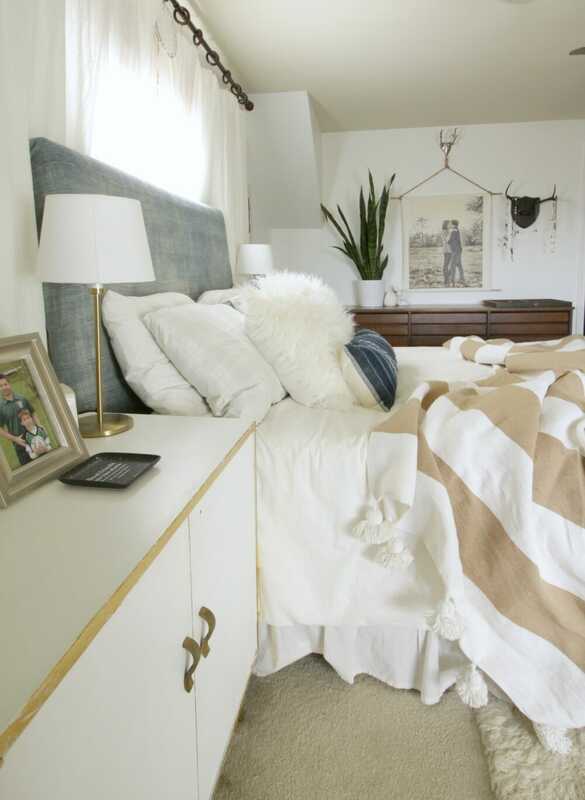 However, that very day, my favorite designer, Emily Henderson, posted her neutral guest suite which had similar colors and her walls were a cooler white like mine and I loved them in her space! I decided that I was going to do everything I could to make my walls work and I think that the little updates to far have helped the bigger picture- I am thrilled with the direction in which this room is headed. 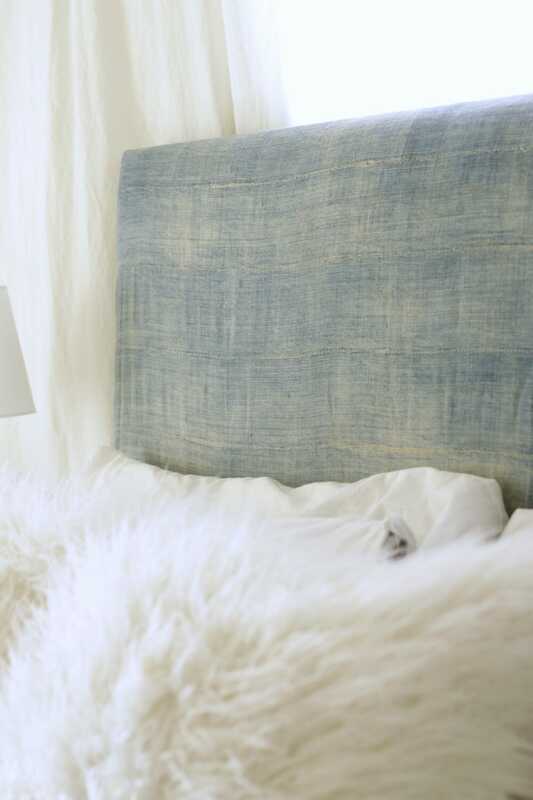 Today I want to share with you the master bedroom progress which features my new favorite piece in there… a mudcloth headboard. In my efforts to spend less money and also hoard less stuff this year, I sold the old screen headboard to a couple planning to use it for the same thing. If you want to see how it looks in their space, you can find it here. 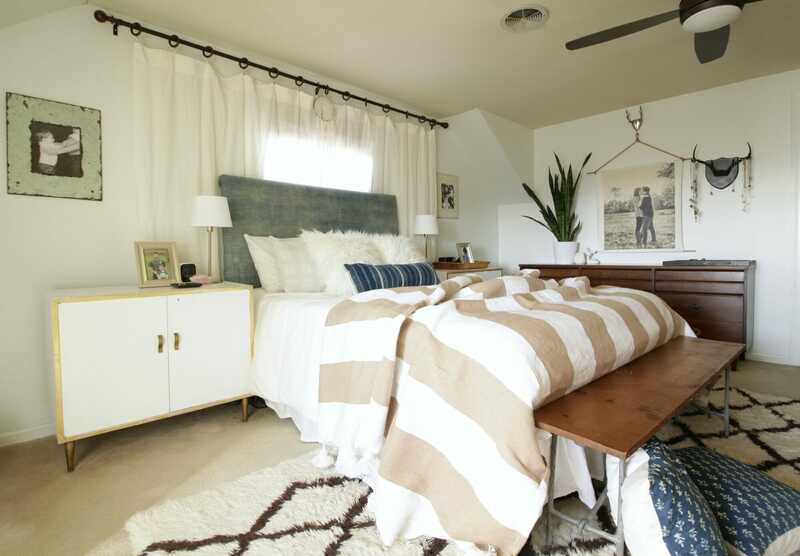 I also sold the lamps I once had in this space, and between those two sales, I was able to purchase the headboard as well as the fabric I wanted for it. 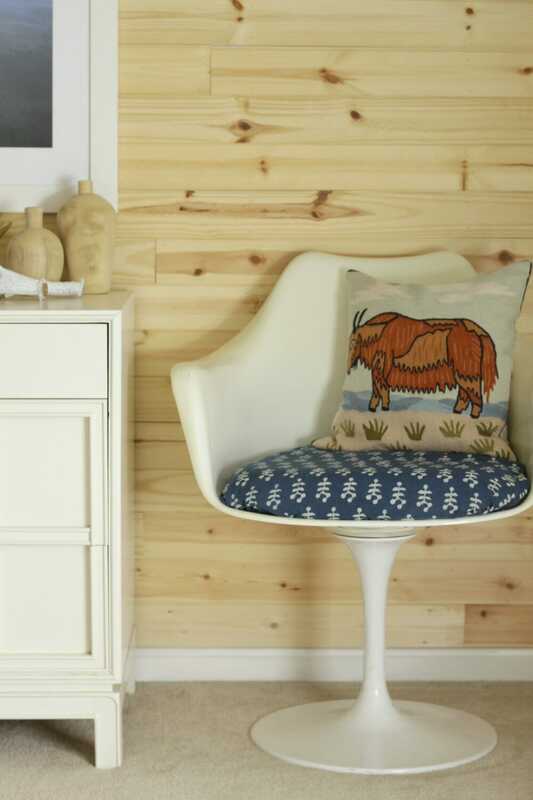 I really liked it as is… it was blue and patterned and lovely, and it honestly looked great in our space. However, I had the look of faded indigo mudcloth in mind. I took to etsy to shop for a piece in the style I wanted and size I needed. The Turquoise Moon had several gorgeous large pieces in my ideal price range. I ordered the one I wanted and Jill, the shop owner, shipped it out that day! Within a couple of days my mudcloth was in my mailbox. Because I wanted instant gratification, I ran up to my room and threw it over the other headboard immediately! As it turned out, it stayed in place really well… so as of now I have yet to staple it on and I may just keep it as is so I don’t damage the fabric underneath at all (in case I ever want to go back to that). I love the texture and color! 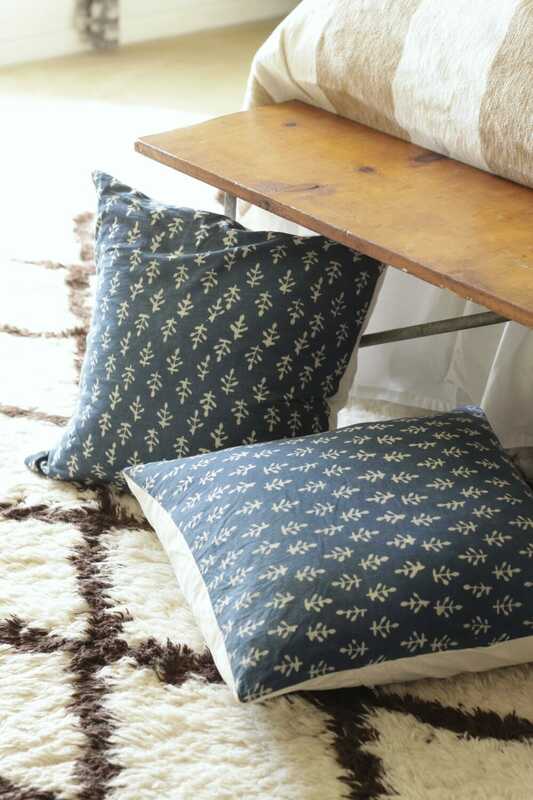 It adds a softer blue and works well with the pillow I purchased when my friend Brittany opened up her shop, The Vintage Rug Shop. It is a vintage piece of fabric, so it’s not perfect by any stretch, but it is perfect for what I wanted. Before I go any further, I want to talk about where all of the inspiration for the changes really came from. There’s one piece of art in our bedroom that is personal, a favorite of ours, and will never hang in any other place in our home. This painting was made from a photo taken of me and Chris to celebrate our 10th anniversary. Before I had it turned into a painting, I played with the color a bit to give it a vintage faded feel, and as you can see it features faded indigos, beiges, creams, and whites… the palette of the bedroom. We love this painting, and it was the perfect jumping off point for the slight shift in direction in our room. One of the things we really needed was a new blanket. We’ve had a vintage Bates style blanket for years, but the age on it is showing and it’s actually quite yellowed. 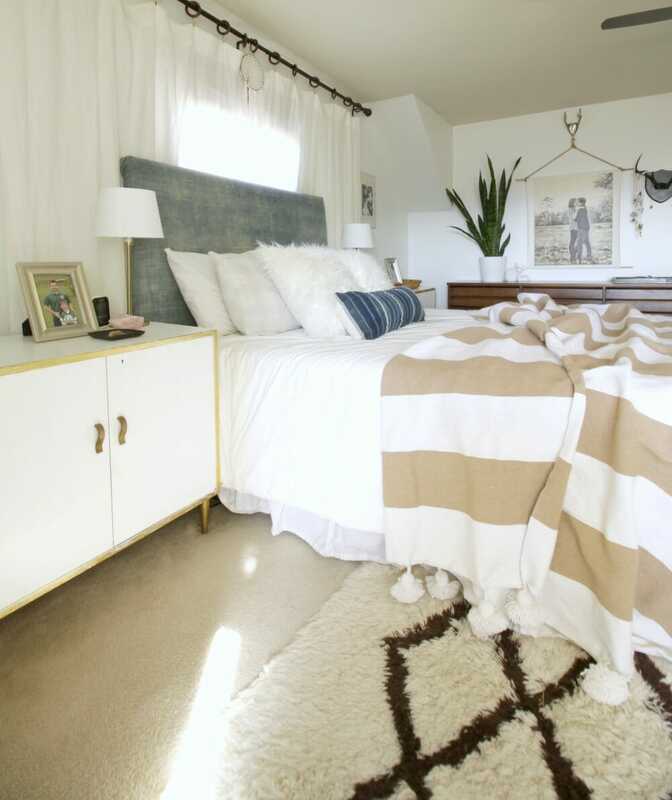 This past fall I found an awesome vintage wool blanket and I loved the look of it, but the feel, not so much. It kept us warm, but man, it was itchy! We received gift cards to Amazon for Christmas and decided to put them towards a nice new blanket for our bed… cotton, of course! 😉 Did you know that Amazon actually features handmade goods? 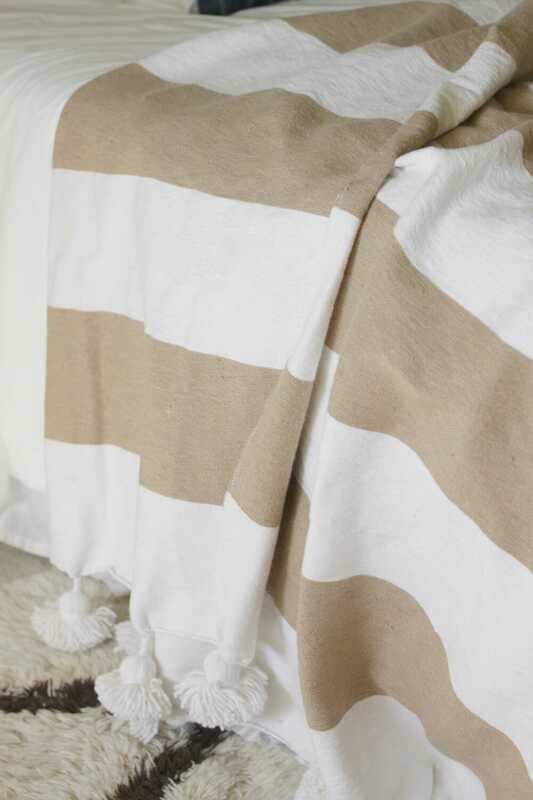 I found this handmade cotton Moroccan tassel blanket there. 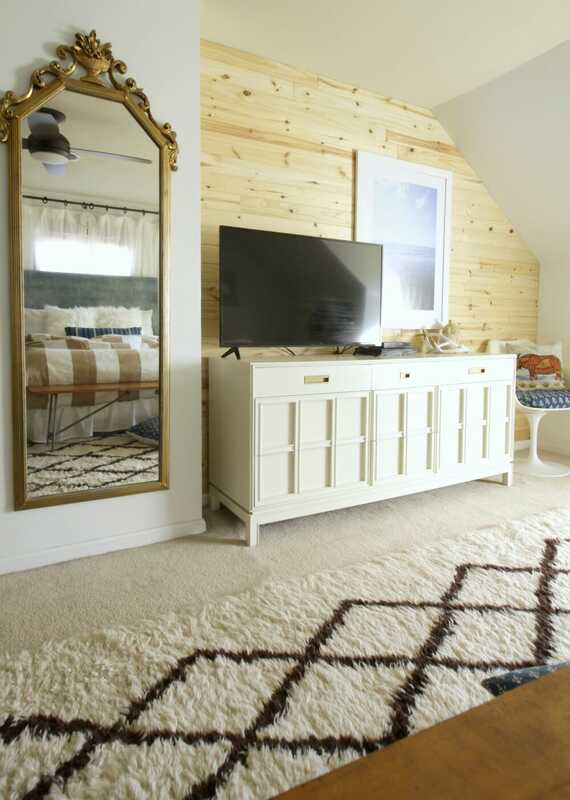 And although beige is not the trendy neutral that gray is, it felt perfect for our space and I ordered it. We are in love with it! It’s well made and a nice thick cotton. The colors on the bedding now bring all of those soft muted tones of the painting together. I know that I thrive off change and every time I switch up this space I think I love it more than the last time… but this time, I really do think I love it the most of any rendition. It feels a bit more grown up and feels like us. 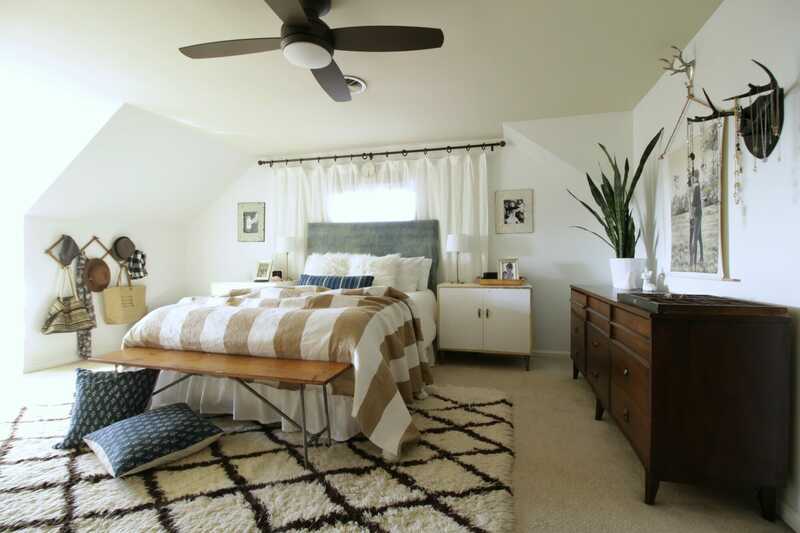 These stripes add a nice classic graphic touch to the room while still maintaining an eclectic feel with the tassels. As you can see, I added some block print pillows I made to the floor at the foot of the bed. (You can find similar for a great price here). My kids often relax here while we watch movies together, so they’ll be used. There will be some other changes coming to the bedside areas that will bring in a little more color, and I can’t wait to share that! For now, here’s a little peek to hint at the color coming. Can you spot it there? Let’s take a closer look… Can you guess? 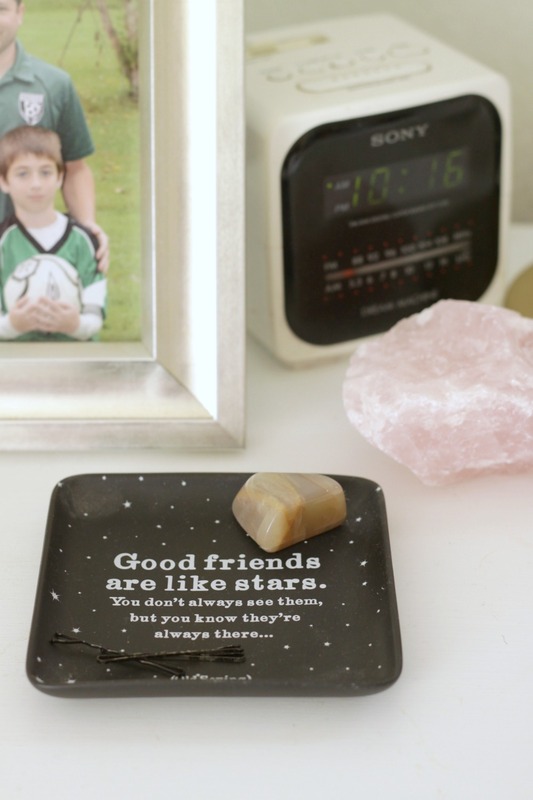 Also, how sweet is this little dish my best friend who doesn’t live nearby gave me. I love the daily reminder of her in my life! Now, let’s talk about the other side of the room where the cream dresser that I felt was causing problems sits. I’ve made a couple minor tweaks over here and really love how it’s working out. For starters, on the dresser I added some elements to bring in some pure white with the cream. 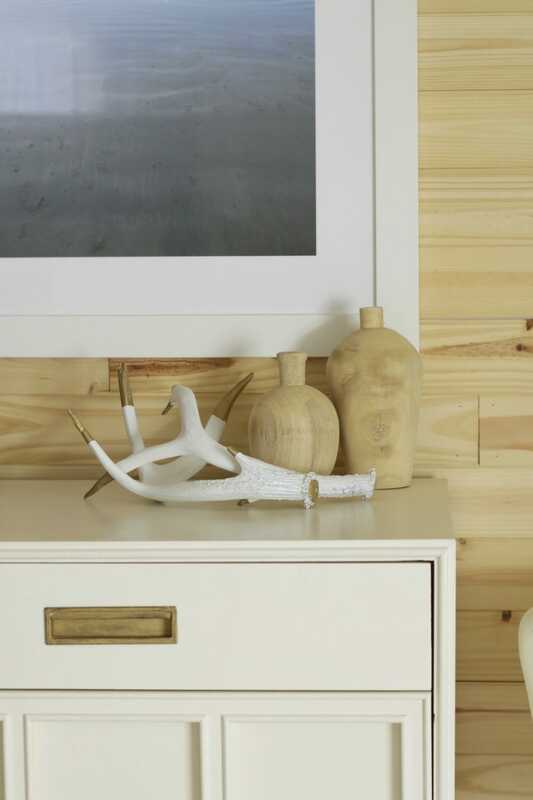 My white and gold antlers were the perfect way to bring in white and keep the feel natural as well. The wood vases I purchased as a gift for a friend for Christmas, but then found something else that was just too perfect for her, so I stashed these away for future use. Welcome to the future. I realize they don’t stand out against the wall, but I love the way it all looks together and makes it all about texture. To the right of our dresser sits a white vintage tulip chair that’s aged and is actually more of a cream color itself. To bring over some of the indigo, I covered the seat of the chair with an indigo block print scarf my parents gave me for Christmas (just by wrapping so it’s not permanent). I will stain them and finally have a place to put many of our family photos including photos of our extended family, none of which I have up in the house currently. What do you think of all the changes so far? 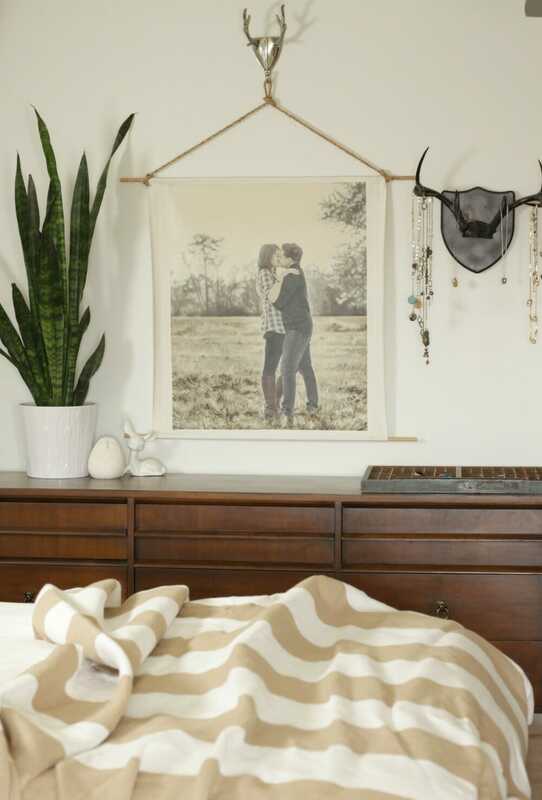 Are you crying over the screen headboard being gone? I truly hope not! I, for one, am loving the room, and I suppose that’s what really matters, right? If you like what you see, I have included a shoppable gallery below for you with affliliate links used for your convenience. Hope you show today who’s boss! It looks so good! I love the mudcloth! 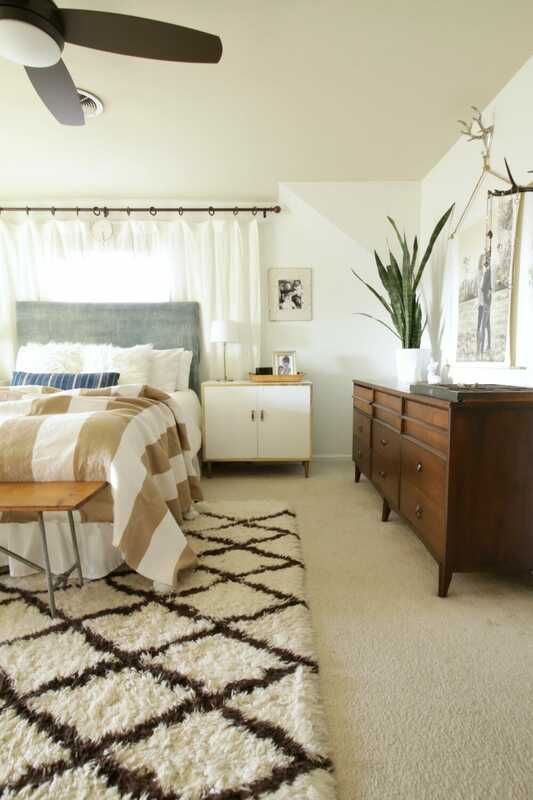 And the stripes with the rug look amazing. Personally, I think beige will make a come back. Gray has had it’s time and it’s too cold to last much longer. that’s kind of what my thinking was, too! beige will come back. let’s bring it back! Love what you’ve done and your plans for the future. And that anniversary painting is just so romantic! Such pretty changes!!!! So happy to hear you’re feeling better about the wall color and dresser. Sometimes it takes me a few days to settle into change before realizing it actually does work. The headboard. Stunning!!! 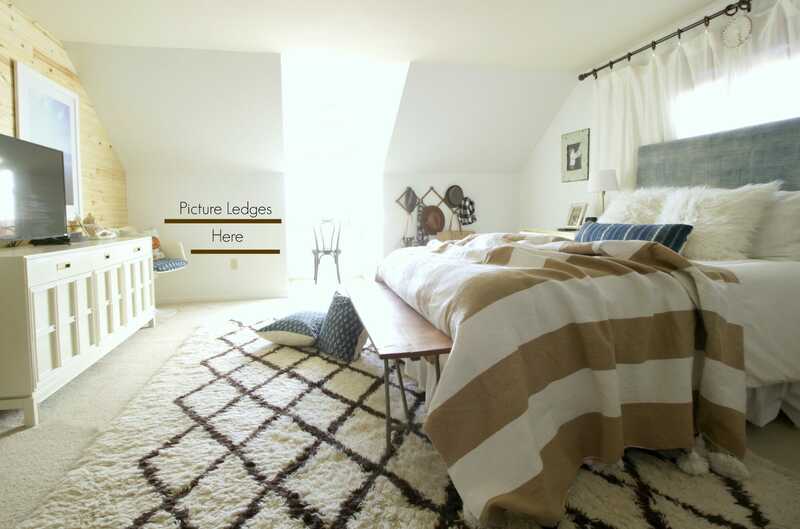 Love the photo ledge idea, and even the blue ceiling which I never would have thought of and can’t wait to see! I didn’t think I couldn’t possibly love your bedroom any more but now I do. It’s so so pretty. thank you so much!!! i am really happy with the changes! love, love, love the new look, Cassie! And YES to painting the ceiling! thank you, heidi! i want the ceiling painted. i don’t want to paint it… gonna have to find some motivation!!! Cassie I love all the new changes you have brought in. The bed is just perfection. 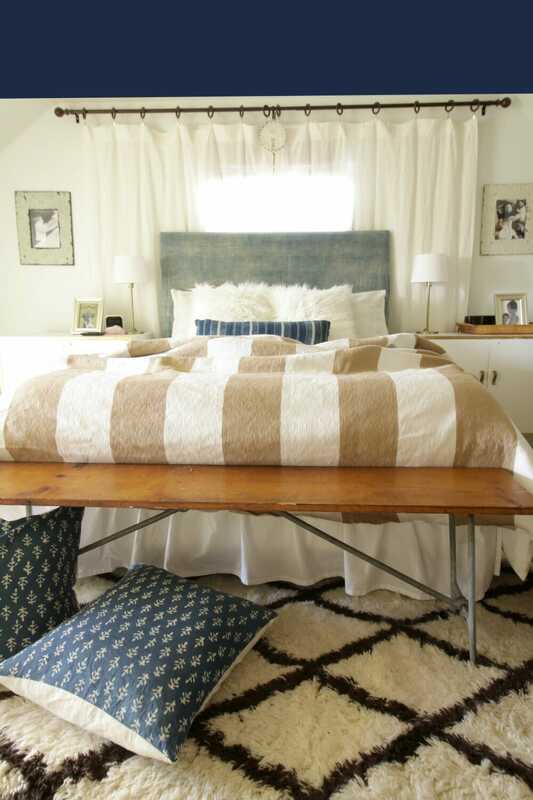 I love the hit of blue from the headboard with the new striped blanket. I can’t wait to see what the new thing is for your bed side tables you are hinting. Could it be brass lamps? Very nice, and that Sony alarm clock is going to be a collectors item soon…wow- wonder what ever happened to the one I had for years!!! I love everything about it much better but I am a more is less person anyway. You didn’t even need to ask people what they would do. You are clearly a master at changing up for the better! aaaw, thank you, vicki! i appreciate it! I LOVE your room! The indigo, the beige! It’s so warm and inviting! And yes, yes, YES to a muted indigo ceiling! I want to see that so badly in here – it would be amazing! i just need to muster up my DIY motivation… i can’t seem to these days. YES! i am hoping to find a pillow i love that will work, but for now i have added family photos from our last session which have blush and plum in them. i will share those next week! Beautiful!!!! 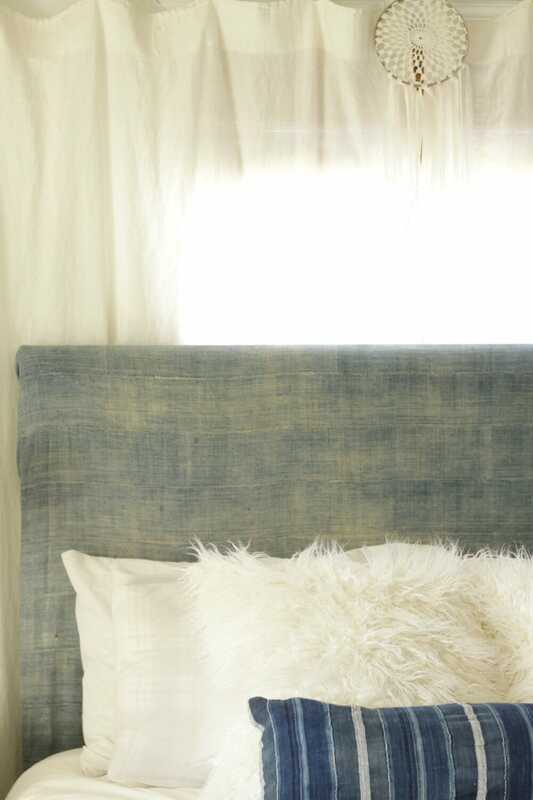 I’m in love with your headboard!!! Though I did love your original look, this update is spectacular! Pinned!! thank you! it’s funny because i loved it, too, but this just feels so right! thank you! i spend a lot of my evenings here so i need to have a space i can relax in.